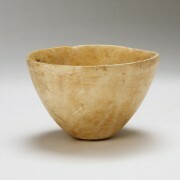 Among the most common forms of Near Eastern pottery, the bowl without handles is presented here in a particular version, with a conical shape truncated horizontally in the lower part and turning into a thin flat base: its diameter is so narrow that it does not provide a stable balance to the vessel. 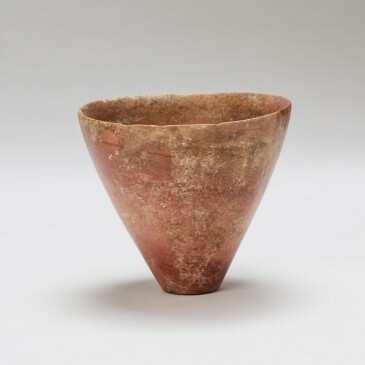 Like many other contemporary stone vessels, this example attests of the high skills and technology of sculptors in times as remote as the Neolithic period. The regular, accurate shape of this vessel indicates that after a rough modeling, the carver would have used a rotating technique, probably employing some sort of lathe; the interior was hollowed out by drilling. 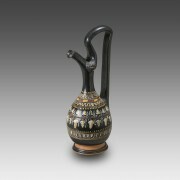 In the Near Eastern world, stone vases were considered luxury goods and belonged to high-ranking individuals or to the treasures of sanctuaries: they were used to store valuable materials (ointments, liquids for female toiletry for instance; but also wheat, oils, etc., given the size of the vessel), as ritual vessels for religious cults, as grave goods, etc. 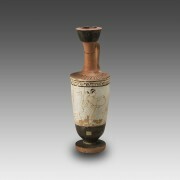 Complete vessel in very good condition; minor chips and superficial wear.